A late double from substitute Joe Dodoo - the second with almost the last kick of the game - gave Rangers a dramatic 2-1 win over Partick Thistle at Firhhill. The Jags edged the goalless first half against a ponderous Gers team who bucked up after the break and were denied what looked like a penalty when Harry Forrester was tackled in the box by home captain Abdul Osman. Forward Kris Doolan opened the scoring for Thistle in the 76th minute before Dodoo, on for Joe Garner on the hour mark, levelled with a volley in the 81st minute and then drove in in the winner in the fourth minute of stoppage time. The goal took the Light Blues above Aberdeen into second place in the Ladbrokes Premiership, with the Dons playing Celtic in the Betfred Cup final at Hampden Park on Sunday. Thistle boss Alan Archibald can be pleased with his side's performance but he was left to rue the lost opportunity for his club to record their first victory over Rangers since 1993. The home side gave as good as they got, and more, in the first half. In the ninth minute David Amoo's low drive was parried by Rangers goalkeeper Wes Foderingham to the feet of Chris Erskine, who returned it towards goal only for it to be blocked by defender Rob Kiernan for a corner which came to nothing. Doolan then raced clear of the Rangers defence down the right and was crowded out after hesitating and moments later a Kiernan tackled took the sting out of the lively attacker's shot after he raced into the Gers box. Rangers, with Danny Wilson in defence for the first time since October as a replacement for the injured Clint Hill, were lacking ideas. However, in the 24th minute it took a fine save down at his left from Jags keeper Thorsten Stuckmann to keep out Kenny Miller's header from a James Tavernier cross following a short Rangers corner. 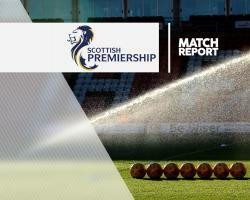 Doolan had a shot on the turn from 12 yards saved by Foderingham as the hosts reminded Rangers of their threat. At the other end a close-range drive from Garner was blocked by Thistle defender Liam Lindsay and, when the two players clashed just before the interval, the Ibrox striker was booked by referee Nick Walsh, when it looked like he had led with his arm in an aerial clash. Winger Barrie McKay replaced Josh Windass for the start of the second half, and moments later the Govan side might have had a penalty. After Lindsay lost possession, Forrester raced into the box before being barged to the ground by Osman but referee Walsh enraged the travelling fans and the Gers players by awarding a corner. But Jags responded and Foderingham made saves from Christie Elliott and Erskine while at the other end Stuckmann smothered an effort from Forrester, who had again broken through the home defence. Rangers picked up the pace as the second half unfolded further with drives from Dodoo and captain Lee Wallace but it was Doolan who struck when, after getting a second bite at a cross from substitute Steven Lawless against Tavernier, he knocked the ball past Foderingham from only a few yards out. The Govan side were stunned and moments later Jags substitute Ryan Edwards clipped the bar with a long-range effort. However, after latching on to a Miller pass, Dodoo eased growing nerves among the huge travelling support when he volleyed in from 14 yards. Rangers pressed for a second goal and, with seconds remaining, Dodoo took a pass from Miller, who had got away from Osman, and drilled the ball low past Stuckmann for a winner which left the home side understandably distraught.